Effect of the increase in 'alcopops' tax on alcohol-related harms in young people: a controlled interrupted time series. Kisely S.R., Pais J., White A. et al. Medical Journal of Australia: 2011, 195(11), p. 690–693. Unable to obtain a copy by clicking title? Try asking the author for a reprint by adapting this prepared e-mail or by writing to Dr Kisely at s.kisely@uq.edu.au. You could also try this alternative source. A tax rise on 'alcopops' was on the agenda in Britain until they fell out of favour among young drinkers. Australia did however increase tax by a huge 70%. This study found no impact on short-term alcohol-related harm among the young revellers of its Gold Coast district, but probably there were broader benefits from reduced drinking. Summary Effective from April 2008, concern about harmful drinking among young Australians led the government to raise by almost 70% excise duty on pre-mixed alcoholic beverages ('alcopops') favoured by young people, based on findings that higher taxes/prices reduce overall consumption of alcohol and, in particular, heavy drinking. However, it is unclear whether tax increases on only one type of drink, as opposed to alcoholic beverages in general, are similarly effective; young people may merely switch to cheaper and potentially more potent drinks. Initial studies suggested the result was a substantial fall in alcopop sales, partially counter-balanced by a smaller shift to beer and spirits leading to a net reduction in overall sales, but the impact on harms related to alcohol remains unclear. Consequently this study used administrative data from the emergency departments of two public hospitals in the Gold Coast district of the state of Queensland in Australia to measure a wide range of alcohol-related health harms before and after the tax increase. Included were common alcohol-related harms such as unintentional and intentional injuries as well as alcohol poisoning, mental and behavioural disorders due to alcohol, and blood-alcohol tests. The data was restricted to 15–29-year-olds (the main target group for alcopops) and spanned the tax change from April 2005 to April 2010. To test more fully for any possible link to the tax change, analyses were done: including and excluding superficial injuries; including all injuries (adjusted for the fraction likely to have been due to alcohol) as well as just those recorded as related to alcohol; and confining the analysis to emergency department visits between 10pm and 6am or on weekends, when drinking was most likely to have been a factor. At issue was the degree to which trends in emergency department visits changed before versus after the tax change. To try to eliminate the possibility that any such change was due to some other factor also affecting young people in general or older drinkers, these trends were compared to those of the same age group presenting with asthma, appendicitis, or any condition not related to alcohol and not an injury, and with 30–49-year-olds with alcohol-related harms. It was also important to adjust the results for seasonal patterns. 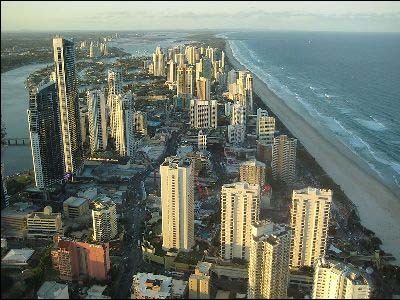 The Gold Coast is a tourist destination ( illustration) popular as a venue for annual end-of-school celebrations – why this high-risk area for alcohol-related binge drinking by young people was appropriate for the study. A fluctuating population also made it impossible to calculate the incidence of alcohol-related harms per young adult. Calculated instead was the proportion of emergency visits by 15–29-year-olds which were alcohol-related. This was compared to the proportions which comparison visits represented of the total number of emergency visits for the same age. If the proportion of visits related to alcohol among young people dipped after the alcohol tax increase in ways not apparent for comparison emergency visits, it would be evidence that the tax rise was having the intended effect. Similar analyses were done for patients known to be Gold Coast residents, for whom it was possible to calculate emergency visit numbers per 10,000 of the same-age population. None of the analyses, whether of specific alcohol-related presentations or these plus all injuries, and across all the variations described above, indicated that there had been any statistically significant falls in actual or potentially alcohol-related emergency visits by 15–29-year-olds after the increase in the tax on alcopops compared with those by 30�49-year-olds or compared to other types of emergency visits. This was also the case for males and females, for patients aged 15–19 years, and for Gold Coast residents. There was not even any evidence of a temporary post-tax dip. The proportion of alcohol-related emergency presentations for 15–29-year-olds on the Gold Coast did not significantly fall after implementation of the alcopops legislation when compared with alcohol-related presentations in an older age group, or with non-alcohol-related presentations in the same age group. Given strong evidence of the effectiveness of taxation in curbing overall alcohol consumption, one interpretation is that price influences average consumption of all drinks, but not risky consumption on a single occasion. A second is that raising the price of just one type of drink may not reduce alcohol-related harms, at least in tourist destinations such as the Gold Coast, raising questions about generalising from the effects of overall increases in alcohol tax or duty to initiatives that target one type of drink. If the findings hold across other health services and populations, more comprehensive approaches may be required, combining fiscal measures such as volumetric taxation for all alcoholic beverages, along with other supply and demand initiatives. These could include incentives to encourage mid-strength and low-strength beers, restrictions on the availability of drinks with a high alcohol content, more effective regulation of advertising, and raising the legal drinking age. Given that the Gold Coast is a popular destination for end-of-school celebrations, the findings may not apply elsewhere in Australia. However, they were the same for Gold Coast residents – by definition, not tourists. commentary As the authors suggest, switching to other beverages means that raising tax on one type of product does not reduce overall consumption of alcohol as much as an across the board price rise or a high minimum unit price of the kind being planned for the UK. Presumably because switching is more likely to happen, the impact of a beverage-specific price rise is greatest on the beverage types which occupy a relatively small place in the market, such as alcopops in Australia (1 2). Since there is nothing in alcopops except the alcohol which would cause harms of the kind the featured study monitored, switching to spirits instead (as may have occurred) would have eliminated some of the expected health benefits of the increased tax. However, there does seem to have been an overall drop in alcohol consumption after the tax came in to effect, suggesting that switching was far from complete. Based on a different set of figures, that too was the conclusion of a team of authors including the chair of Australia's National Preventative Health Taskforce. They also cited evidence that after the tax rise fewer secondary school were drinking and fewer doing so at risky or high-risk levels. Whilst acknowledging the limitations of a single-beverage tax rise, they argued that "the alcopops tax has had a positive effect in reducing alcohol consumption." This may have been because the tax in effect raised the floor price for spirit-based drinks. Until then alcopops had been much cheaper than spirits. The tax rise equalised the excise rate with straight spirits products, meaning some switching was likely among spirits adherents to straight spirits and among alcopop adherents to wine-based alcopops, but also that access to cheap spirit-based drinks had been closed, apparently reducing consumption overall. That still there was no health impact in the Gold Coast may, as the authors suggest, have been because the single-occasion, celebratory, and once a year 'binges' which probably accounted for much of the harm are not as price sensitive as regular drinking. Unlike the Australian consumption records mentioned above, a study from Germany focused on the targets of alcopop taxes – young drinkers. Perhaps because of this focus, it found greater impacts on alcopop consumption, and provided direct evidence that teenage drinkers (defined as having drunk in the past week) switched to spirits in response to a specific alcopops tax rise in 2004 which nearly doubled their retail price. School surveys either side of the tax rise in 2003 and 2007 revealed that the proportion of 15–16-year-old drinkers who consumed most of their alcohol in the form of alcopops had more than halved from 27% to 12%, while for spirits the same proportion doubled from 8% to 16%; there were also lesser increases in the proportions preferring wine and beer. The total amount of alcohol drunk by the children had not changed significantly, but its source had, consumption from alcopops nearly halving (25g down to 14g) and from spirits increasing (from 14g to 19g). There was also a non-significant increase in consumption in the form of beer, but practically no change for wine. The authors interpreted these findings as evidence for a partial substitution of alcopops by spirits, which did not result in a significant reduction in total consumption due to a small increase in beer drinking. Increase in spirits consumption among young people was considered a "negative side effect of the alcopops tax", because a preference for spirits is associated with riskier drinking patterns and more problems. It might be thought that one positive effect would have been to partially shut a gateway to drinking for young people, but in fact across the full school samples (ie, not just past-week drinkers) significantly more had drunk in the past week in 2007 than in 2003, and the age drinkers had started drinking was virtually unchanged. As in Australia, concerned by alcohol-fuelled violence and disorder, before the elections in 2010 the Conservative Party in Britain was planning significant tax increases on alcopops as well as strong beer and strong cider. In the event, once in power duty was increased only on strong beers and ciders. Concern over alcopops had plummeted along with their consumption, which in 2010 the Treasury noted had fallen by almost three quarters between 2001 and 2008, until they represented only 8% of alcohol consumed by 18–24-year-old hazardous male drinkers. The Treasury's conclusion was that this category of drinks were not now "disproportionately responsible for alcohol-related harms". The expected �0.45 or �0.50 minimum price per unit of alcohol being planned by governments for England and Scotland would hardly affect the category of drinks including alcopops, which already sell for a relatively high per unit price. Among the 18–24-year-old hazardous drinkers over which there is most concern, alcopop consumption is expected to slightly increase in response to a minimum price, while overall consumption would steeply fall as the cheaper drinks became more expensive. More relevant to alcopops is a ban on selling the products at a discount, in Scotland expected to have a greater impact "The impact on RTD, whilst small, is greater than that seen for any of the minimum price thresholds considered." (though still small) than any level of minimum price tested in the model. In November 2012 the government for England consulted on a ban on off-licence promotions offering discounts contingent on buying several drinks at once. Scotland implemented such a ban in October 2011, with no obvious short term impacts on sales in comparison with England and Wales. Thanks for their comments on this entry to author Steve Kisely of the University of Queensland in Australia, to Peter Miller of Deakin University in Australia, and to Andrew McAuley and Mark Robinson of NHS Health Scotland. Commentators bear no responsibility for the text including the interpretations and any remaining errors.